A retired chief inspector and football fan says somebody "could've died" when police used batons after a West Midlands derby match. 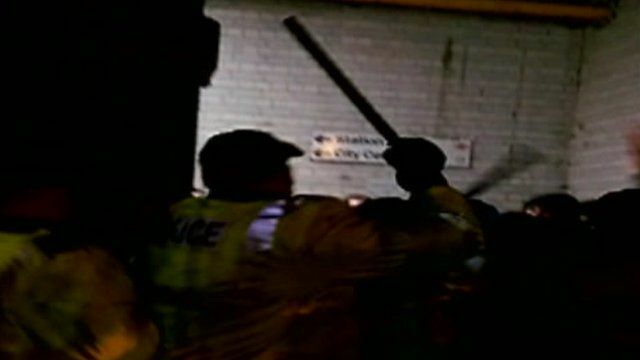 Opposing Wolverhampton Wanderers and Birmingham City fans clashed near to the railway station after Wolves' 2-1 home defeat, West Midlands Police said. It said officers "issued several warnings but to no avail and were forced to quell the disorder and used appropriate and proportionate force". Blues fan Nick Glynn, who served with Leicestershire Police for 30 years, said he filmed police behaviour on Friday and described it as "potentially unlawful violence". Mr Glynn said after the game Blues supporters were singing, he did not think Wolves fans were there and it "didn't sound" to him like public disorder. Wolves supporters were believed to have thrown bottles, seats and coins following Blues' second goal and 13 arrests were made on Friday evening, police said.